Parker P. Miller "Paaahkar", passed gently to the Rainbow bridge. One of our bestest bloggin kitteh furriends on da entire blogosphere, Miss Parker Pie Miller, passed away from cancer on Thursday, May 24th, 2012. We are so sad and at the same time understand she has now moved on to spread her wonderful love around "Over the Rainbow Bridge". May she be running and playing with a happy heart and spreading her love to all those wonderful furriends who have gone before her. Parker is gone but truly will never be forgotten by us. "She asks that donations be made in her memory to the Humane Society of Allen County to help other kitties find forever homes like the one she had. The link to that is here - any amont of support would make her angel heart so happy. Thanks to everyone for the outpouring of love and support. Our hearts are sad about our lovely friend Miss Parker Pie, we already miss her but know she was lucky t get ten years full of love. We love your new header showing your beautiful eyes. We are feelin the sads. It was a sad day for us yesterday. 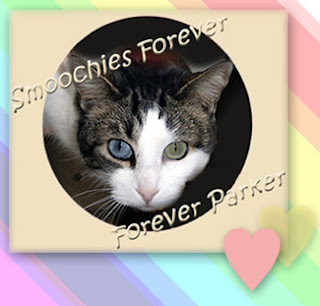 I am purring lots for Parker's family. We will miss Parker Pie very much. We miss our sweet friend Parker very much. I loves teh Parker. Rest in peace.